Designed to work alongside anti-virus products, Zemana AntiLogger adds an essential security layer. While an anti-virus will protect you against a wide range of malware, Zemana AntiLogger is able to stop advanced threats developed with a specific objective: to steal your private information or gain access to your secure internet connections. The vast majority of banking and financial transactions take place on SSL secure sites whose URLs begin with https. SSL data encryption reliably secures your data during online shopping and financial transactions. Sophisticated banker trojans are designed to steal your data directly from your PC, while you are entering it and before it gets encrypted, for transfer over the internet. This is an attack method used by the infamous ZeuS. Zemana AntiLogger is one ofthe very few products on the market that is able to close this dangerous vulnerability by intercepting and shutting down suspicious processes. Zemana’s IntelliGuard is a smart early warning and response system that makes Zemana AntiLogger easier to use and more reliable than ever before. Through IntelliGuard, your AntiLogger references in real time the latest community intelligence base of threats; and threats detected on your computer are scanned against over 40 malicious files databases. Zemana AntiLogger will prompt you when someone is trying to obtain access to your keyboard, regardless as to whether it is a known or new piece of spyware, banker trojan, financial malware or custom designed spy tool. Screen input through virtual keyboards or image recognition is increasingly used as an extra security measure. Yet, if you have screen grabbing malware on your computer, the criminals will be able to see what is shown on your screen and where you point and click with the mouse. With Zemana AntiLogger your screen is safe from spies. How often do you copy and paste sensitive material? We all know we shouldn’t, yet most of us do it. When you copy something, it remains stored in your computer’s clipboard, where it can be made away with. As part of Zemana AntiLogger’s all‐round protection, your clipboard is safe from intruders. Yes, it is possible that your webcam and microphone can be turned on remotely, and if a pro is doing this, the status LED on your webcam will remain off. Zemana AntiLogger constantly monitors all processes accessing your Webcam and microphone and will prompt you when an illegal application is trying to switch it on. Malware relies on invading your system’s sensitive areas, like its registry and physical memory (RAM), so it can inject its malicious code and seize control of your PC. Zemana AntiLogger’s System Defense module secures the very heart of your PC in a future‐proof way: it detects malicious attempts based purely upon their behavior, regardless of whether or not the malware attacking you has been identified, isolated, analyzed and your anti-virus product updated. I have used previous version of this, and been impressed. It has thrown some false positives, but this lightweight tool seems to catch things other AV/AM software sometimes does not. Mind you, this is not a replacement, but it is a nice addition. I look forward to trying this new version. Hopefully it is as good or better than it was a few years ago. had the last one, needs to say pro at top. installs over the old one without uninstall. great program catches browser bugs didnt know had. I have been a beta tester for this and despite numerous reports this still give a lot of false results so beware before trusting it. Wow, that is interesting. I too have been a beta tester for them and I have used this software for years and never had “a lot of false results”. The only time I have is when it is an installation file and, frankly, I am glad ZAL sees that as an issue and warns me beforehand in case it is not something I am actually installing! Trading that minor inconvenience for the security this program offers is a no-brainer! I saw an offer for this application which I thought might be an update to the one installed on my computer. I hadn’t used mine since installing it so decided to do a scan. Scan stopped at 90% for a long time. It had hit on a program which I wanted it to ignore but it still wouldn’t scan any farther. I X’D it out and discovered that I couldn’t open any links on my computer. It said that none of them were safe because they were not secure. Had to uninstall this program to be able to use my computer again. I have used this product for years. I highly recommend it. It once caught a very innocent looking flyer making program trying to access my camera and record my keystrokes. It stopped it from installing. Works fine with my anti-virus program. In a world with ever-increasing data security concerns, remaining cautious is no option. Employing a manual approach in undertaking my online transactions has always been a pain. In an attempt to find a more efficient and easy way to deal with possible identity and financial information theft, I landed on Zemana AntiLogger Premium. This is what I discovered. In a few minutes, Zemana AntiLogger Premium was fully installed and running. The main window has options that gave me faith and a quick summary of my protection status. Updating signatures takes place regularly to give real time protection. The ID theft protection being ON was also impressive. The clean-cut interface displays details regarding the last time of scan, last update check, and license and system status. I was able to custom scan individual files by dragging and dropping them on the specified location. Under the settings option, selecting the General button will display a drop-down option with over 20 languages to choose from. I found this option resourceful especially for people from different geographical locations. For notifications, there is an option to choose to choose to display notifications on the task bar. Zemana AntiLogger Premium provided me with two scan options; the default smart scan and deep scan. I choose the Create Restore Point option, Deep scan, and scheduled the scan to take place during system startup. Other available options included choosing specific days and time for the scheduled scan. I found Zemana AntiLogger Premium’s scan reports quite handy. The report captures the date and time, type and result of all the scans performed. Based on the Result column, I was able to figure out how affected my system was and made the appropriate decision regarding file usage. The application also has a Quarantine report with options to restore or delete quarantined files. Right from the start, Zemana AntiLogger Premium has a quick status summary to show whether my computer was protected from ID theft or not. With the option ON, the AntiLogger was able to scan for banking Trojans like Bradesco before alerting me appropriately. Apart from auto launching on system startup, Zemana AntiLogger Premium automatically loaded unknown objects for scanning. In case the software detected and blocked a threat, it played a sound, an option you can opt to de-select. 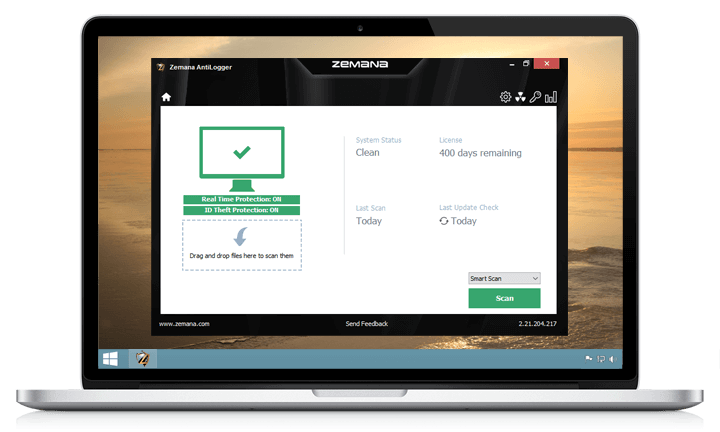 Zemana AntiLogger Premium is a stable anti-virus with a good number of protection options. It can be a good pick for people who would want to add another layer of protection regarding their online identity and information. The program’s ability to smoothly function alongside other installed or default anti-viruses like Windows Defender is also a plus. I did some research earlier today and one of the concerns was that the commenters were unable to uninstall it. I can’t remember why they wanted to do that. Obviously this brings up a red flag as that could indicate that something nefarious going on. Would you have any thoughts on that? I gather from your comments that you find this to be solid, high quality application which is definitely worth having as an additional item for protection from the bad guys trying to take control of our computers. Any additional thoughts would be very much appreciated. Obviously near impossible to register to get a free copy so ill pass on this tried joining their group danced in circles to try and get it registered . So im guessing its a bogus give away to get your email and spam your account . They also do not answer emails asking what the issue is . Yes, I, too, had much difficulty trying to register, and that, even after joining the group. I tried a few times with install and reinstall and never did get Zemana Antilogger registered. It kept spitting out that the registration/license was invalid. After, I did uninstall with its own installer, Revo discovered a load of left over keys. When Zemana AntiLogger is installed, Zemana AntiMalware very recently installed through SharewareOnSale is automatically uninstalled. Both products on the same machine are disallowed. “Designed to work alongside anti-virus products, Zemana AntiLogger” does not apply in this situation, if you consider that the correct definition of malware protection includes that of also virus protection. Basically, the product installation today was, without any notice given on the front end of the offer, a waste of time. Also, the GUI is vastly different than depicted, making use of the flat, blah Windows 10 sort of look, which minds many of kindergarten. Make sure you have a ten foot pole. When you can’t find a great giveaway opportunity like this one, then you can buy it at half price on Zemana.com’s “black friday” weekend sale. You can activate your new license code bought from their site at any future time when the one you have expires. I consider this anti-logger protection vital if you are going to protect your important personal information. nice, to get the key (witch it is automatically downloaded once you get to the directions), you must join a group. I get enough email as it is, no thanks. I will be deleting the download after this reply.